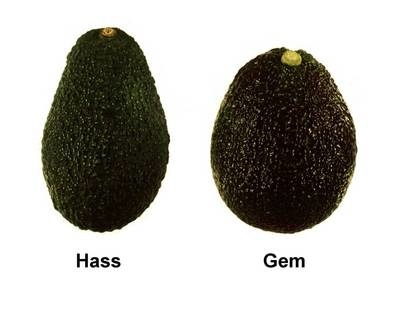 'Hass' avocado versus 'GEM' avocado. Photo credit: Arpaia lab, UC Riverside. This is growing well in my grove. This is a patented variety and I only have it in the grove for research to see how it grows in our hot and humid environment. There is a good article from UCR here with a lot of information on this variety. So far what I see is encouraging. The tree is growing very well and has set some fruit on its first flowering post top working. Very much as described in the literature. The foliage hides the fruit. Perfect for So. Florida since the Lamb Hass and Hass the fruit gets burned from exposure to the sun. I'm not sure about maturity period here in So. Florida. I had not been paying much attention to this tree and did not recorded the flowering time this year. August 5, 2015: The tree is holding the fruit well. Quite a few for its first flowering. The tree is holding the fruit and is clean no diseases. The pictures I took today indicate that the fruit is larger than most of the Hass and Lamb Hass I'm growing so it does not seem to suffer from dwarfism. It has a smother skin than Hass and rounder in shape. The larger of the two fruit I took pictures of today are at this point close to the size of a store bought Hass. If this fruit grows another inch could be an interesting one to watch specially if it eats well here. Not suffering from some of the issues of the Lamb Hass. I will be watching it closely from now on. The tree itself look happy, green and growing slowly with a lot of foliage you really do not see the fruit until you start looking for it. August 25, 2015: I keeping closed tabs on this tree since there are a lot of people following. I did notice some fruit drop on the ground. Not too concerned since there is plenty of fruit on the tree. Some times the tree will drop excess fruit. Good quality in a tree. We are in the middle of our hot and wet season. The tree keeps growing the fruit, so far looks clean, no disease. Some of the fruit that gets direct sun will burn. The tree hides most of them inside the foliage. Looks like my fruit is very close to the size they should be. Very encouraging. September 16, 2015: The fruit is on the tree, no visible or significant fruit drop. The fruit is about the size of a large Hass now. 9-10 oz but looks glossy and green so far. An amazing tree, it protects the fruit from the sun like a tree version of a mother hen. September 22, 2015: Can't stay away from this tree. I have tow trees I have been concentrating in the northern tree which is in full sun. I visited the southern tree which is not in full sun, is between two larger trees. To my surprise is larger and has a good number of fruit as well, hiding them from the sun. See today's pictures. ​October 18, 2015. Some small fruit has dropped, not sure why, the tree is still holding a decent amount for a first year. Looks this is going over to at least next month. I did piked on from the ground and opened to see. Small seed just like a Hass. The fruit in the pictures is like 6-7 oz. I still see no significant color change so I did not pick a fruit, I will wait for next month. Seems like the fruit on the tree are in the 14-16 oz range. October 26, 2015: I saw a fruit turning black. Not sure if it was natural ripening of the sun getting to it. I picked it. 9.4 oz. I think is a bit smaller than the others in the tree. The bigger ones are probably 10-12 oz. Let's see what happens. The tree needs to be checked every week now. November 3, 2015. The fruit picked above turned out to be a disappointment lets hope is because of sunburn. Pictures speak for itself. November 22, 2015: Did a dry weight test on one of the fruits picked on the 18th. It came in at a very respectable 28% Considering that Hass can be picked at a minimum of 20%.According to University of California Riverside. The fruit looks clear and bright, let's see how is the ripening process. December 12, 2015: All the fruit left on both tree is in the ground with the exception of 2. Did picked those two and appliend a post harvest fungicide to see. October 29, 2018: A bit late in the update. But the two trees I had I cut them down and recrafted them in 2016. I could not get any clean fruit out. The fruit just does not grow well in Homestead.